With the public downfall of Doug Phillips, many Christians are reevaluating his solution to the family crisis in America. To that end, the following speech is offered as a different solution to this real crisis. This is a written version of the speech given at the Family in Crisis Symposium of 2012 in Denver. When my parents became Christians we quickly took to the culture of our local church like fish in water. We faithfully attended public worship: morning, evening and mid-week. We attended Sunday school. We communed with saints. We participated in the latest conferences. By God’s grace I listened attentively to my parents. I paid attention to my pastor and my teachers. I dressed conservatively. I never dated. I never listened to rock ‘n roll. I even confided in my parents. Many nights we discussed various issues. I read the Bible. I prayed. And I tried my utmost to obey God lest I lose my salvation. And I was not saved. From age ten to seventeen, I had a zeal but not according to the knowledge of the Gospel. The gospel I grew up with was weak, truncated and impotent. And so was my life. According to various statistics and pastoral testimonies over the years, the American church and family are in a terrible state. Divorce rates are too high. Church attendance is too low. Worldliness is widespread. And many youth are leaving the faith. Families are confused. They seek out exciting speakers, the latest 10 step-programs and hope that God will somehow revive them outside of the ordinary means of grace. 65% of Americans aged 18-41 have made a “personal commitment to Jesus”. 3% of this group have a nominal biblical worldview that does not even include a clear description of the Gospel. Well has Hosea declared: “My people are destroyed for lack of knowledge” (4:6). Is it any wonder why many Christian families are weak and impotent? If they have more programs, more laws and even more prayer and Bible but have no Gospel, what has the Church wrought? I was a part of those statistics. Although outwardly, my life growing up appeared ideal by conservative standards, inwardly I was a mess. My experience was not unique. This fact struck home a few years back when I saw myself in the evening news: a tall, skinny, dark-haired boy with glasses by the name of Matthew Murray. His life, as he explained in his chat room sessions, eerily mirrored my own, right down to the Gothardite legalism, charismatic emotionalism and a despair-filled conscience. Any objective evaluation of this family crisis must include the fact that a man-centered religion has replaced a Christ-centered Gospel. When legalism or lawlessness infects and weakens the wonderful doctrines of grace, families will begin to crumble. A weak gospel creates weak families. There are certainly other historical and cultural reasons for the crisis of the family, but the most fundamental is an ignorance of Bible, especially the full-orbed Gospel of our Reformed fathers. Since the fundamental problem in the Christian families and churches of America is gross ignorance of the Bible, especially the Gospel, the solution is obvious. The crying need of the hour is biblical teaching. But this is not all. A healthy return to the means of grace in the context of the Gospel is required. There are many possible responses to this problem, but I want to focus on the pastoral response both at the local and regional churches. Pastors have a duty to lead the flock to the waters of redemption, both in public worship and in life. Christ’s ordinances, especially the Word, sacrament and prayer, must be faithfully exercised and their meaning explained (LCQ 154). The Spirit makes the reading, but especially the preaching of the Word, an effectual tool for Christian growth (LCQ 155). The Word of God, being the means of grace par excellence, must be wisely applied and boldly proclaimed. The preaching and teaching must include an application of the Law, both for rebuke and regulation of the Christian life, as the churches see particular weaknesses among their flocks. There are certainly many things the leaders of the church can and should do. Families must be catechized. Parents should be instructed. Children must be baptized. Older people should teach the younger. And the wayward must be disciplined unto godliness. But all of this is vanity if the native man-centered religion of our hearts is not uprooted by a saving faith in Christ. Pastors must unswervingly proclaim the Good News of the Person and Work of our Lord and Savior. The need of renewed faith in the Sovereign Christ should be a defining mark of one’s ministry. When more Christians begin to believe in the wonders of God’s love in Christ and hope in His return, they will begin to be motivated by love and faith instead of self-righteous ignorance or guilt-ridden fear. Pastors have a duty to the regional church as well. When one part of the body hurts, we should all feel the pain. Likewise, when families need help, there should be no hesitancy to bring help from other churches if needed. Such help is demonstrated in cooperative events such as this symposium. Another duty within the regional church is to deal with this family crisis in some coordinated manner. Having conflicting voices only brings confusion to many families seeking help. One such voice heard by many Christian families is the National Center for Family Integrated Churches. The importance of examining this voice is amplified because sister Presbyterian churches have signed its public confession concerning this present crisis. 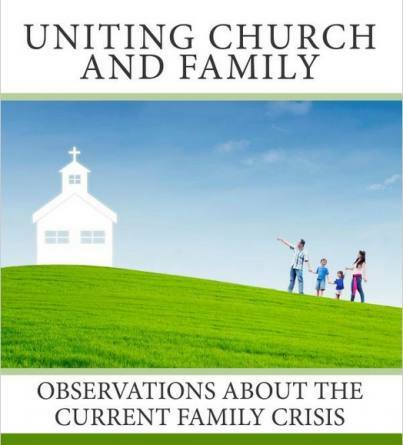 This Uniting Church and Family confession denounces “comprehensive age-segregation”—Sunday school, vacation bible schools and the like—as based in “evolutionary and secular thinking.” This organization contends that the current family crisis is especially rooted in educational practices that separate the children from the parents, especially by age [the newest iteration of the NCFIC confession has omitted some of this language, but has not recanted from the sentiment as a one-on-one meeting with Scott Brown (9.2.15) proved]. This organization’s founder and current board member, Mr. Phillips, believes the family crisis is being overcome through a revival of homeschooling: “Home educators, almost by definition, have turned their heart to their children…there’s been a revival that’s taking place in the heart of these homeschool families.” He also prays that all churches in the world would be family-integrated. Others similarly declare homeschooling as “the single most important family-reformational movement in the world.” Homeschooling and family-integrated churches are revivals even as they are asserted to be morally normative. What are we to think of this confession and these claims? Historically, they have no leg to stand on. It is also ironic that Presbyterians and Baptists can sign such a document when they differ on the origins of Christian nurture: infant baptism. The solution to the family crisis is not homeschooling or family-integrated churches. These activities considered in and of themselves are not wrong. But to the extent that these methods are stressed at the expense of the Message of the Gospel, they become a problem. True family integration is not mere physical proximity or only moral similarity, but it is spiritual unity in the Spirit within the Church of Christ. Many Christian families across this land are in dire need of help. Too many are ignorant of the basics of God’s law, the means of grace and especially the Gospel. This is where the duty of the Church and the pastor in particular becomes important. Pastors must help the parents and children move forward unto greater godliness. Pastors must help retrain families into the life of the Church. And they must preach and teach the Law and Gospel. Anything less will continue to weaken Christian families.